The KS-D1 Digital Soil Moisture Tester, used with the GB-1 Gypsum Soil Blocks, make up a valuable system to monitor the soil moisture available to the plants. This system eliminates guesswork so that irrigation can be effectively scheduled according to plants' requirements. The blocks are buried at one or more levels, depending on the crop and the depth of the root zone. 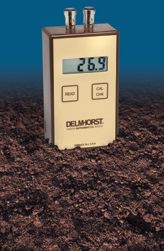 When the blocks’ lead wires are connected to the meter, an indication of the available soil moisture is immediately obtained on the meter display. The meter readings can be converted into terms of available soil moisture or soil moisture tension by referring to calibration curves.